“iPad is disabled connect to iTunes” Solution and How to Fix it? 1 How to restore locked iPad? If you have come across this article, there might be the case your iPad might be disabled and you are not able to access it. iPad locks automatically after six failed attempts of trying the passcode. And you might not be access it because of the error saying ipad is disabled connect to itunes. You need not to worry about it because we have the fix of this problem and keep reading to know the solution and unlock your iPad so that you can use it again. However, though your device will be ready to use but there is high chance that you will lose your data again, hence it is highly recommend that you backup your data with iTunes. How to restore locked iPad? As I said already, only follow this method if you have backup of you iPad with iTunes. Connect your iPad with PC or mac with iTunes installed and synced with your device. If your PC doesn’t have itunes, download it using this link and install it. If iTunes asks for passcode and you don’t know it, then skip this method and try second method below. Wait for iTunes to sync your iPad and make its backup. After the sync has finished, click on restore iPad. When you will be at setup screen, tap on restore from iTunes backup. Now, select your device and wait for it to restore your data. That’s it, data synced with iTunes will be restored on your iPad and it will start working. If this method doesn’t work for you, then try the below method. But using this method you will not be able to get your data back. But your device will start working. You might be interested in reading best strategy games 2017. WARNING! This method will erase all your data and you need to use iPad as new device and set it up. Unless you have a backup in iCloud, you will not be able to restore your data. So, it is always better to keep backup in iCloud of any of your iOS device. Follow the steps below to erase your iPad and remove passcode by entering into recovery mode. Connect iPad with PC or mac and open iTunes. Force Restart your iPad by holding power and home button simultaneously until you see the recovery mode screen. On your computer running iTunes, following window will appear. Now, it will restore your iPad, wait for sometime for it to restore your iPad. Proceed to “Choose backup,” then choose from a list of available backups in iCloud and it will restore from your backup. If you don’t have backup and setup as new device. 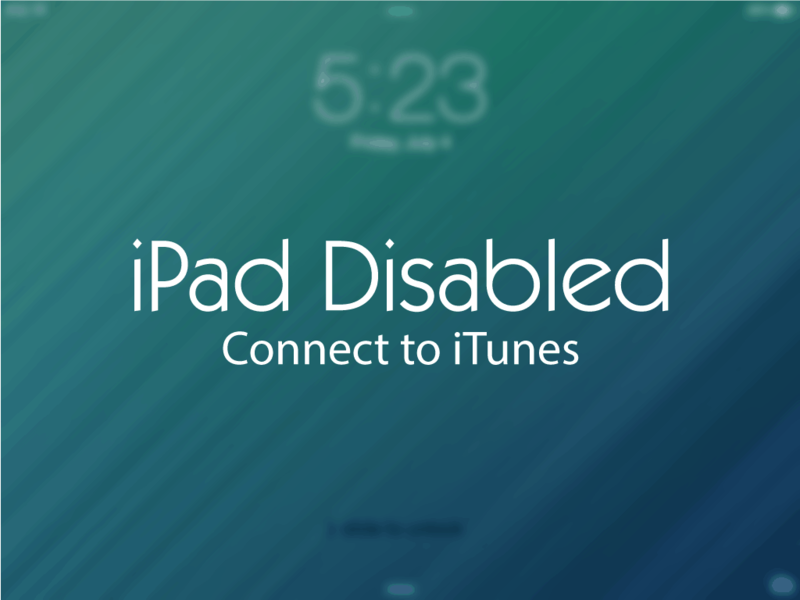 That was it for the post, if any of your friend has “iPad is disabled connect to iTunes” error in his/her iPad, share this post with them so that they can also recover their iPad. Same is the method for iPhone or other iOS devices facing similar problem. Thanks for reading 🙂 If you are facing any problem, then comment below. I don’t have my MacBook to plug in the iPad. I only have the iPad at this time. How do I get out of Disabled mode without my (stolen) computer?